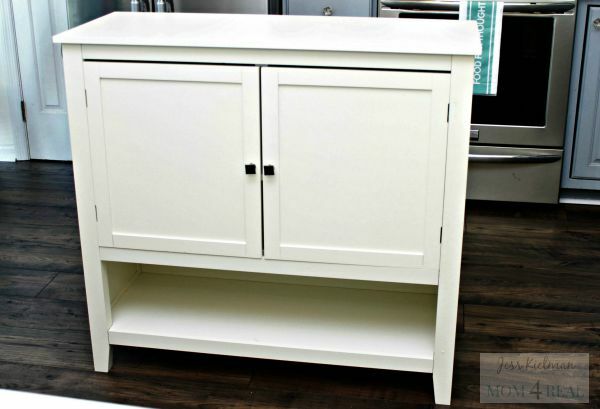 I can’t wait to show you how easy it is to create a kitchen island for a small kitchen using a sideboard! Y’all know I love a good hack…turning something that you don’t really need into something that functions for you is one of my favorite things to do. Recently, I teamed up with Porch and Wayfair to come up with a back to school hack using something from my very favorite place for all things home, Wayfair! We live in a small home, so storage is always a pretty big issue for us. We needed some additional storage in our kitchen, so I knew instantly that I wanted to find something to add. We have no kitchen island, so that’s what I wanted to focus on. This is the sideboard that I started with. 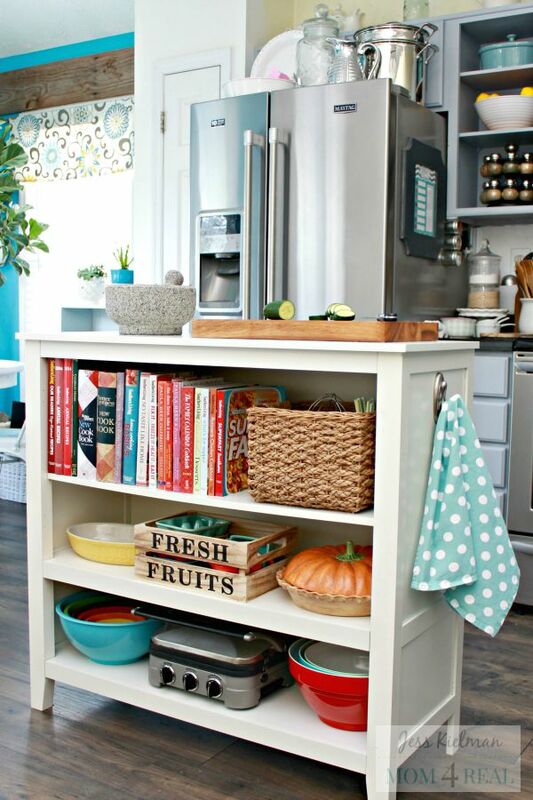 It’s super cute, and I love it with the doors on it, but I really wanted open shelving. For me, if I can’t see something it doesn’t exist…out of sight, out of mind. I started by removing the doors. I also didn’t have a ton of room for opening and closing the doors. Just by taking the doors off and adding a few hooks, I doubled the storage space in our kitchen. I have a place to hang my strainers so they are easy to grab when I need them. I was able to bring my cookbooks down to a level where I could actually get them out for menu planning. I added a basket to corral lunch packing items and straws, and was able to store my sandwhich press/grill on a shelf so I would remember we owned one. I’m so bad about forgetting I have things when I can’t see them. Now…pressed sandwiches for everybody! I added a hook on the others side to hang a tea towel for hand drying and such, and also added a piece of butcher block to the top for added food prep space. We have very little counter space, so this was my favorite addition! 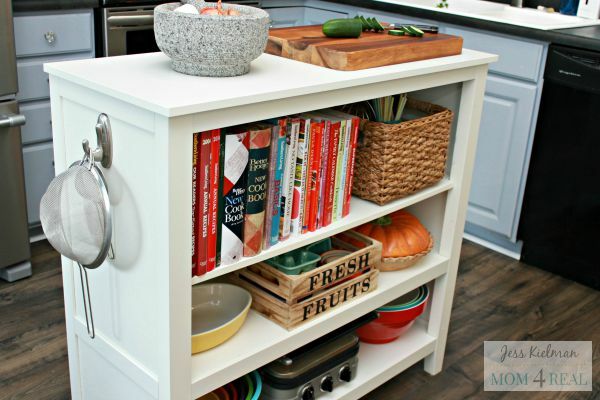 I couldn’t be more happy with the kitchen island addition to our kitchen! 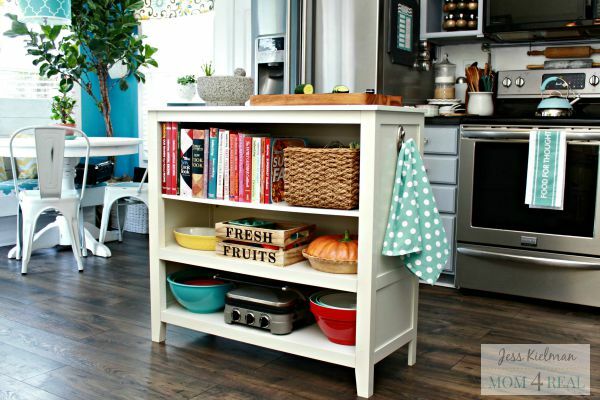 It’s the perfect size for a small kitchen with little room and no island. 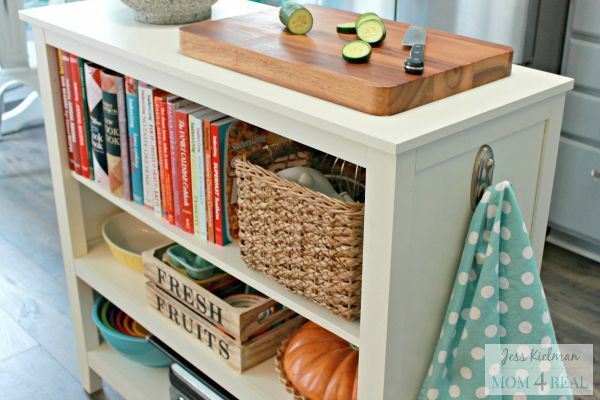 If you think outside of the box a little bit, it’s easy to add additional storage space to your small kitchen! This post was sponsored by my friends at Wayfair and Porch. All opinions, ideas, photos and styling are 100% mine. Great news! Porch, Wayfair and Lonny Magazine are hosting a fun Instagram Contest! From September 7th – 14th at 11:59 pm, tag two friends in the comments on THIS PHOTO and you will be entered to win a $500 Wayfair gift card and $500 of cleaning services from Porch!